To the skirts of the conical form include those in which the difference between the width of the skirt at the bottom, folded in half (EE), and measurement of poluobhvat waist (St) is greater than 2/3 the length of the skirt. It is necessary to consider a uniform expansion of the skirt along the entire length. The skirt is conical in shape can be recommended to women with a significant difference between the poluobhvat hips and waist (15 cm). For conical skirts is characterized by the lack of Darts at the waist line and considerable width at the bottom. From point T down vertically lay the cut is equal to the distance from the waist line to the hip line, and put a point B.
point O as centre of radius equal intervals FROM ABOUT HE conduct of the arc. On the arc FROM the delay measurement poluobhvat waist St and get the point T1. 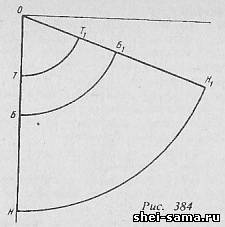 ТТ1 = 38, see Point About T1 and connect a straight line continuing it to the bottom line. The intersection of this line with the line of the hips is denoted by point B1, and the bottom line is - P1. Then check the width of the skirt at the hips. The old product (Fig. 385 a). Dress straight silhouette, potrebnoe waist, made of dyed knitted fabrics. Breast tuck moved to the neckline and is designed in the form of an Assembly. Sleeveless dress. New product (rice, 385 b). Set consisting of a short shirt and skirt. The soft blouson shape fitted through a stitched belt with two rubber bands pulled through the line. Width 2.5 cm elastic Sleeve zelenolistnye with back and front on in-depth neckline supported by shoulder pads with a thickness of 0.7-1 cm, are cut like a set-in sleeve. Front and back decorated with carved asymmetrical lines. Draped collar TACAN in a slightly extended and in-depth neckline. The skirt is conical in shape. Length to mid-calf. 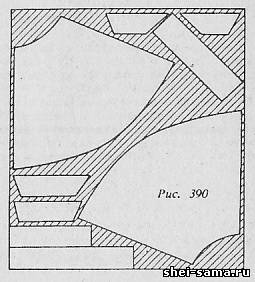 Construction drawing of the model. For design patterns the blouson take the base design of the product with zelenolistnye sleeves, encircle it on thick paper and make the following change in design according to model. To increase a slouchy fit through the waist basis lengthened by 2 cm, then outline the decorative and constructive lines. Front blouson (Fig. 386). 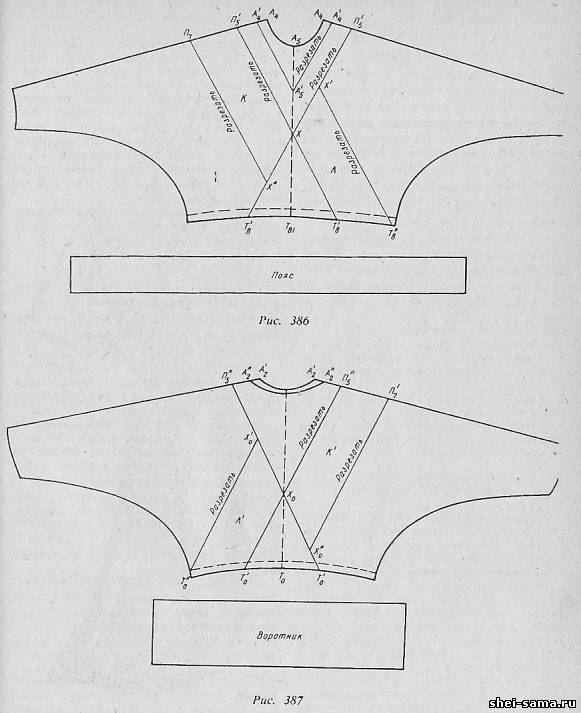 To determine the line of vrachevanie collar lay symmetrically at the shoulder sections of the front segments equal to 2 cm, and put a point A14. In the middle of the front of the point A5 delay period equal to 11.5 cm, and denote the point A15. Then, the resulting points A14 and A15 connect with a straight line and draw a line vrachevanie collar. For the design of lines, resembling the letter X, from the point A14 on the continuation of the shoulder cut delay periods equal to 4.5 cm, and denote points tribe-apparatus P15. Bottom line from the point of kzt81, lay left and right at 11.5 cm and denote points T18. Then point tribe-apparatus P15 connects asymmetrically with the points T18. The point of intersection of these lines denoted by the letter H.
From point X up down left right and lay the cut is equal to 15.5 cm, and respectively denote the points X1 and X11. Point-tribe-apparatus P15 left on the continuation of the shoulder cut lay cut, is equal to 12 cm, and denote the point P7. The resulting point P7 connect by a straight line with X11. To the right from point T18 hem lay 13.5 cm and indicate the point of Kzt118.. The resulting point Kzt118. connect a straight line with a point X1. On lines A14 A15 A14 tribe-apparatus P15 T18, П7Х11 and Х1Т118 before you cut. Parts K and L cut out from the fabric of the skirt. To define a line resembling a letter X on the back from point-A112 for the continuation of the shoulder cut delay periods equal to 4.5 cm, and denote points П115, from point t0 to the left and right - at 8.5 cm and oboznachaya points T10. Point П115 the right and left sides of the back asymmetrically connect the straight lines with points T10. The point of intersection of these lines represent X0. From the received point up left and down right lay the segments is equal to 15.5 cm, and accordingly oboznachayut points X10 and X110. From the point П115 right to continue delaying the shoulder cut 12 cm and denote P17.The point P17 is connected to the point X110 straight line. From the point T10 to the left on the line side of the cut lay cut, is 13.5 cm, and denote the point of T110. The resulting point T110 connect a straight line with a point X10. Along the lines of П115, T10, P17 X10 X110 T110 and the back cut. The details of K1 and L1 cut out from the fabric of the skirt. 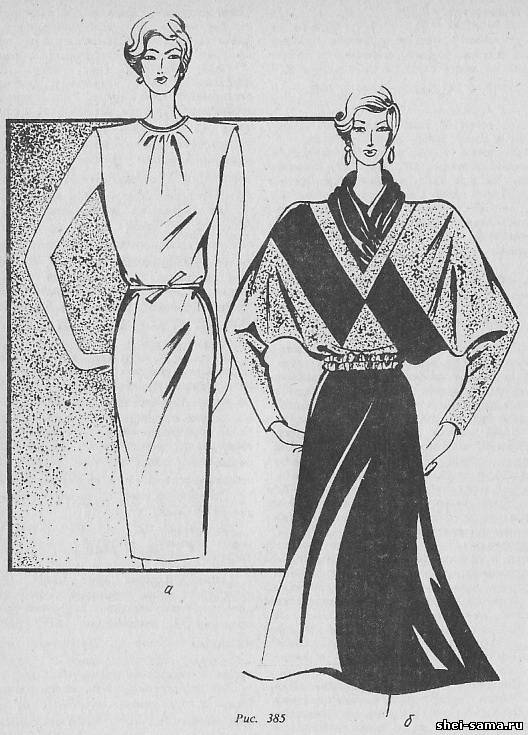 Collar draped at the level of the shoulder sections. 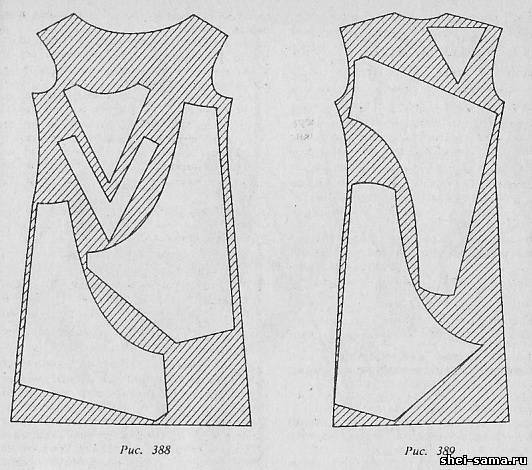 Skirt cut out design of the conical skirt (see Fig. 384). The layout of the parts on the cloth is recommended as shown in the drawings, 388, 389, 390.